I recently shared the story of Mr Darcy, my beloved Seal Point. A week or so before he died I was doing some end of life research and had gotten rather upset. I thought looking at the cats on the Humane Society's website might help me feel better. Although I was intending to get two new cats fairly soon after Mr Darcy died, I did not intend to get another Siamese. I thought another one would remind me too much of Mr Darcy. 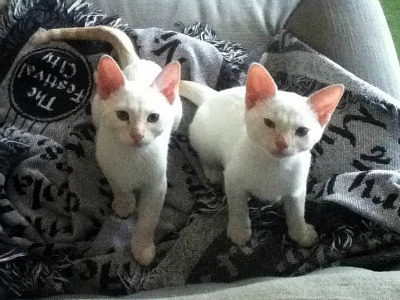 But I came across a litter of four Flame Points, all male, about three months old. The pictures of them were from when they were only a few weeks old and I was immediately taken with them. I knew as Flame Points they would look quite different from Mr Darcy. I decided if they were still available after he died I would try to get two of them. The day after Mr Darcy died, my sister and I visited the Humane Society. By this time only two of the kittens were still available - I knew they weren't actually at the Humane Society because they were in a foster home. First we looked at many of the cats that were there. I even considered a few, but I was set on having two, and we didn't find two that seemed to get along well. I finally asked about the Flame Points and talked to their foster mom on the phone. We made an appointment to meet her and the kittens at the Humane Society the next day. I went back to the Humane Society to meet the boys with my friend. She was a bit concerned that it was too soon and told me to trust my instincts. We met the boys and as I held each in turn they immediately snuggled up to me and my friend said that even her instincts were going off. So I filled out the paper work and paid the fees and took them home. I have named them Tybalt and Mercutio from Romeo and Juliet. I have had my eye on Tybalt as a cat name for awhile because in the play he was referred to as the Rat Catcher and the Prince of Cats. When I decided I wanted two, Mercutio was the perfect companion name. Of course this Tybalt and Mercutio are the best of friends and won't end up killing each other. Their full names are Tybalt Am Sergeant Tibbs Rumpleteazer Howland and Mercutio Si Flynn Rider Mungojerrie Howland. For those who don't know the references, Si and Am are the Siamese cats from 'Lady and the Tramp'. Sergeant Tibbs is the cat in '101 Dalmatians' who helps rescue the puppies. Flynn Rider is the hero in 'Tangled' and Mungojerrie and Rumpleteazer are a pair of mischievous cats from the musical 'Cats'. My sister came up with their collective name, the Creamsicles. Tybalt is shy, the whole first day he hissed every time I touched him, and daring. He is the master of the toys and very jealous of them. He snuggles more and has great jumping skills. He is the taller of the two and his fur is softer. His nose is longer and pointier than Mercutio's. Mercutio, while not as daring as Tybalt, is busier and more adventurous. Tybalt is taller but Mercutio is stockier. Mercutio is very into the food. He always comes running when I fill the food dishes. He doesn't seem to be overeating but I am keeping an eye on that. He has a rounder face than Tybalt. 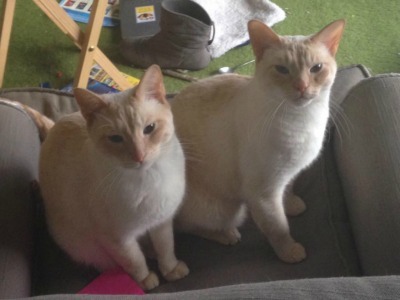 Both boys are still mostly white with orange ears and tails. Their tails are striped. When they came home, there was just a hint of orange on their noses but that is starting to come out more especially on Tybalt. Their feet were completely white when they came home but now they are starting to look dirty. Of course, I still miss Mr Darcy a lot, but the Creamsicles are helping a lot. It is quite the change to have two rambunctious kittens. 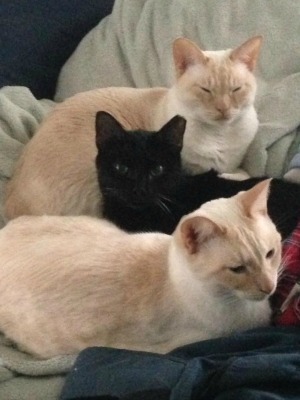 Julie submitted this story in 2013 not long after the kittens came to live with her, but because for some reason it came through without photos, it was never published. Julie recently posted a photo of Tybalt and Mercutio on our Facebook page - they've now been with her for just over two years. This is a recent photo of them, taken in the same location as the one above. They've grown a bit! It's followed by one of Julie's favorite photos of them with their friend Van Gogh, which she calls 'Perfectly Stacked Cats'. Thanks so much for your story, Julie, I'm sorry it's taken so long to publish it but it's lovely to see how Tybalt and Mercutio have grown up. I wonder if they are still as rambunctious as they were when they were kittens? All the cats look very healthy and I love the photo of them with Van Gogh! What a bunch of sweeties! I especially love Mercutio's round face. I've always had a soft spot for ginger tabbies and have been mom to two, but recently brought a Lilac/Lynx point meezer into my life. I adore him. The flame point now seems ideal. Truly the best of both worlds! Tybalt and Mercutio are simply beautiful! Their subtle markings are charming. And I love the serenity in their faces. You knew, didn't you, when you saw them, that they were meant for you. Your cats are beautiful, love the names. Lovely story, nice to hear it has turned out to be the purrfect match for you, good luck with the future with your furry babies. The boys are still quite rambunctious. Their personalities have mostly held true. Tybalt is still shy and feisty. He'll come out when strangers are over and hiss at them but eventually you might get to pet him. Mercutio turned out to be a little shyer than Tybalt. He'll come out for strangers but it takes longer for him to approach. Van Gogh is the shyest of all. He was born feral and a bit of that has stuck with him. He wants to be with me all the time but hides under the bed when people come over. He'll usually come out after awhile but only a very select few have been able to pet him. They all started a new adventure last August when my sister got a Beagle puppy. Cousin Cedar Pocket visits often. They were scared of her at first but they have proven to be master dog takers. Pocket is quite intimidated by them even though she is twice their size. I think they will become friends when Pocket who is almost a year now gets older and more mature.